So I pull my bike out of storage (2007 GV-650) and notice the coolant is completely empty, which strikes me as odd. After I refilled it I ran the bike for a few minutes with a clean piece of paper underneath to see if there's any leaking, which there isn't, so that's a bonus. I've tried to find an image in the owner's manual and the shop manual showing me what this tube is, but haven't found it yet. I'm not even sure that it's supposed to be connected, but don't want to set out in a 1000 km ride without being sure. Can someone help me out identifying this hose/tube please? It'd be much appreciated. 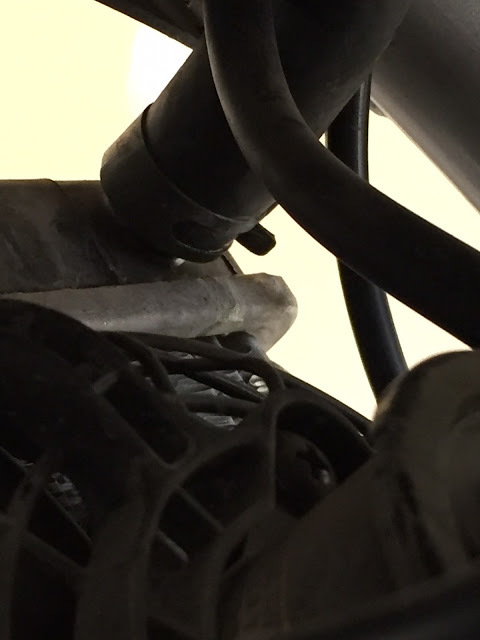 Re: 2007 GV-650, Are these tubes supposed to connect? It's the overflow. It's supposed to just hang down. Normal. Loosing all your coolant. Not normal. What's your oil level like? Too high perhaps? ..see where my thoughts are headed yet? Check the colour of your oil if it is high. Thanks for the quick replies folks. I took it for a short ride this evening after refilling the coolant. Bike ran fine but after I parked it in the garage and came back about 10 minutes later there was a small puddle on the floor. I didn't think to take pictures, but I'm pretty sure it was oil. We checked the oil level and it was perfect at the F line. Upon closer inspection it looks like it had collected in the bottom of the radiator cover and dripped out of the small hole at the bottom. I can't seem to find where it would have been leaking from however, as the lighting out there after sundown is awful. So is it somehow possible that the coolant is ending up in the oil and causing an overflow somewhere? I had an oil change done just before I put it in storage. It was stored with a full tank inside my folk's garage and had fuel stabilizer in it. I didn't see any puddles or stains there when I picked it up. I envy you folks who are savvy with this stuff...it's quite frustrating for me. I just want to ride the stupid thing without worrying it's going to strand me somewhere. Ok progress has been made. 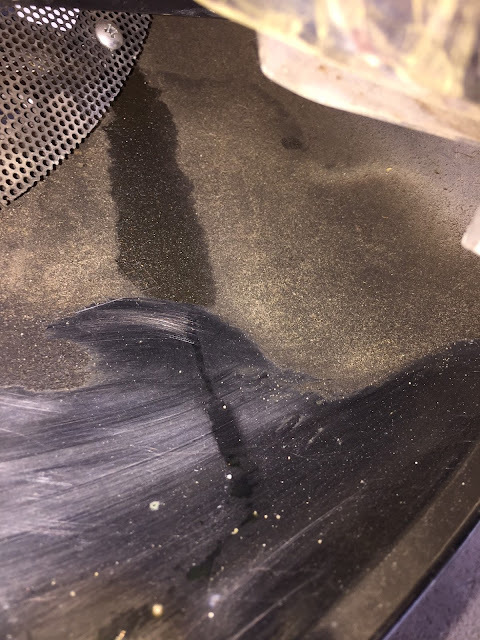 I've identified that the fluid is definitely coolant, and it seems to be coming from both sides of the radiator, somewhere not visible without removing the radiator cover. The other day I refilled the coolant and took the bike out for a short ride (~50 km), which is when I noticed the first leak. I've done the same ride twice more since. The second time was when I took the photos below. The amount of coolant that leaked was less than the first time. I checked immediately after I turned the bike off and it didn't appear to be leaking while running, only after I turned it off. I did the same trip again shortly after, and this time there didn't appear to be anything leaking out. The coolant level also appears to be unchanged from when I refilled it. I'm thinking at this point a loose or cracked radiator hose. According to the service manual it looks easy enough to take the radiator cover off to check...so it looks like I have a project for tomorrow. 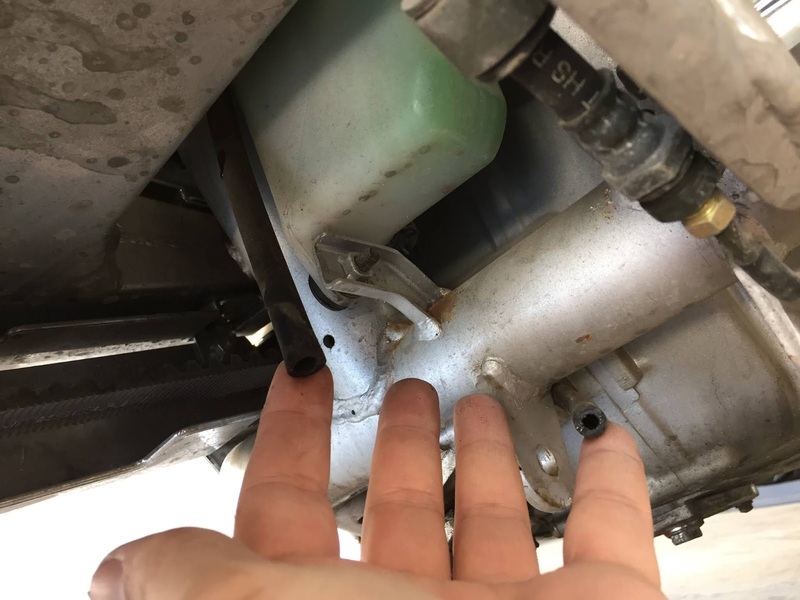 Looks like the radiator hose isn't flush where it joins to the radiator. Looking at the hose itself it doesn't appear to be cracked or damaged. Should I take it off and replace it, or can I simply adjust the connection for a better join? I've never seen clamps like the ones used to hold it on, so I'm uncertain they can be reused if I disconnect it. 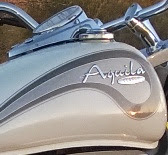 There is also a slight warp in the radiator itself, which it apparently from the bike body flexing over time. Is this anything to be concerned about? Any suggestions / advice would be greatly appreciated. The hose clamps CAN be reused, but I don't suggest it. Just get some of the old fashioned ones that actually work. ..just don't over tighten them, as the connector on the radiator is plastic and it will crush. I do think you probably found your leak though. That or a pin hole in that flex point on the radiator. Definitely put the hose on properly first though and test. 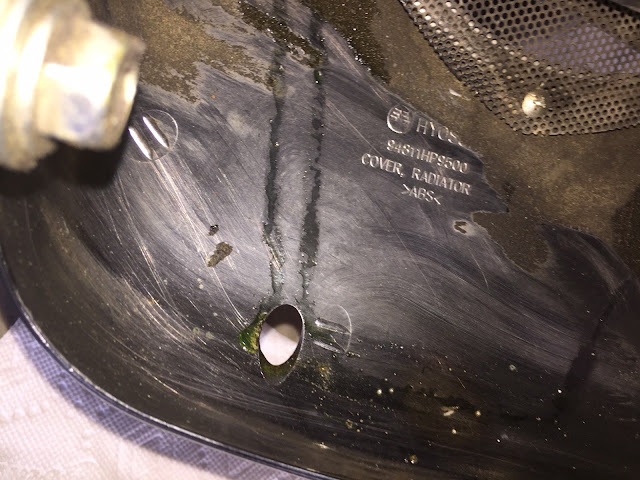 Yes, the body flexing did cause the radiator to buckle and it is cause for concern. Eventually the radiator would fail as a result of that. There is a thread somewhere about elongating the mounting holes in the radiator to ensure it doesn't flex along with the chassis. Makes the holes oval shaped and don't tighten the mounting bolts, loctite them instead. This allows your chassis to flex without squashing the radiator. Are you referring to this thread here about the radiator fix? That sort of modification might be outside my skillset / available tools. Is there another thread I should be looking at for further information? I'm off to get a replacement clamp to repair the leak, which is at least making me feel somewhat better! Nah, that's what happens if you don't elongate the holes in the mounting brackets. You won't need to braze it unless one of the rows has already split open. Look around for a post that talks about using a round file to change the shape of the mounting hole. I ride & I vote. Sounds like you've got a small split in one or more of the radiator tubes. Check the tubes near the left side mounting bolts with a magnifying glass. There is a known fault in the design of the radiators on the GV. 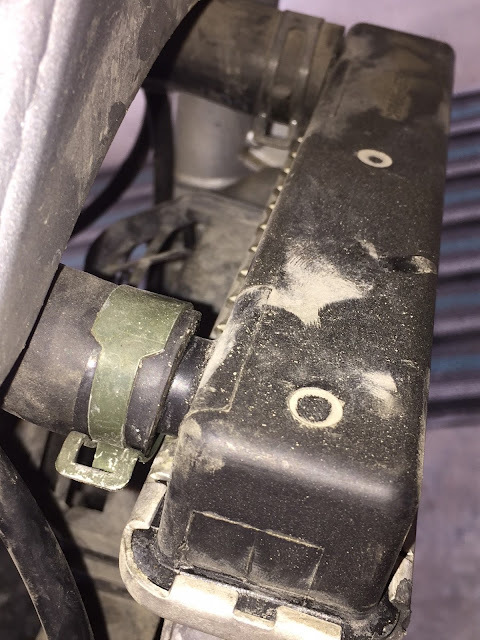 The holes that the rubber grommets fit into are not elongated sufficiently to allow enough movement of the bike frame without making the radiator part of the frame. 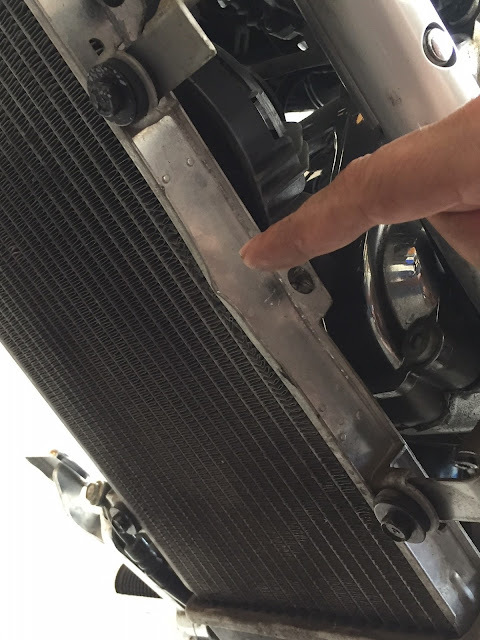 Continuous stress on the radiator at the mounting bolts causes fine hair line cracks in the radiator tubes. Read one of my earlier threads in this issue. 2011 GV250 - 2011 GV650C - It's not 'what' you ride, it's 'that' you ride.